Perl Package Manager (PPM) installs pre-built Perl modules into ActivePerl. The ActiveState PPM repositories currently contain 13,000 to 16,000 modules per platform. They are easy to search with the PPM client, either from the command-line or from a GUI (see “How to install CPAN modules into ActivePerl“). However, sometimes you may want to know if a module is available on a particular platform to decide if you can use it in a multi-platform project. 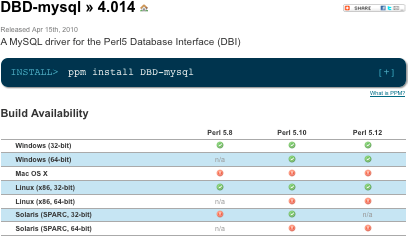 The PPM Index page shows a nice matrix for all ActivePerl versions and supported platforms. A green checkmark shows that the module is available, whereas a red button indicates that the build has failed. Clicking on the button will bring up the build log. If you are a module author, you may want to look at the build log to understand why the build did not succeed on the PPM build servers. Check out all the other search options and display features at https://code.activestate.com/ppm. Jan Dubois is a senior Perl developer who maintains Win32::OLE and is the technical lead for the Perl Dev Kit. Before joining ActiveState, Jan created innovative solutions for customers in the German banking and insurance industry. He holds a Masters Degree in Physics (Diplom-Physiker) from the University of Hamburg.